Leeches and Chironomid pupa, the perfect trout meal!! There is no question leeches are an extremely important food source for Stillwater trout and char. Leeches are long-lived and are available to fish all year long. Despite reaching large sizes in terms of overall length, trout really do seek out even the smallest of leeches. They come in a wide variety of colours with predominant ones being black, mottled brown and black, brown and green and shades of green. When tying leeches consider materials that will add movement to the fly. Long fibered dubbings, rabbit hair, marabou all work well in creating flies that swim. Real leeches swim horizontally through the water and that is why tying balanced leeches make sense. Fishing leech patterns and particularly balanced ones under an indicator presents the fly in the horizontal position and through a consistent depth zone. 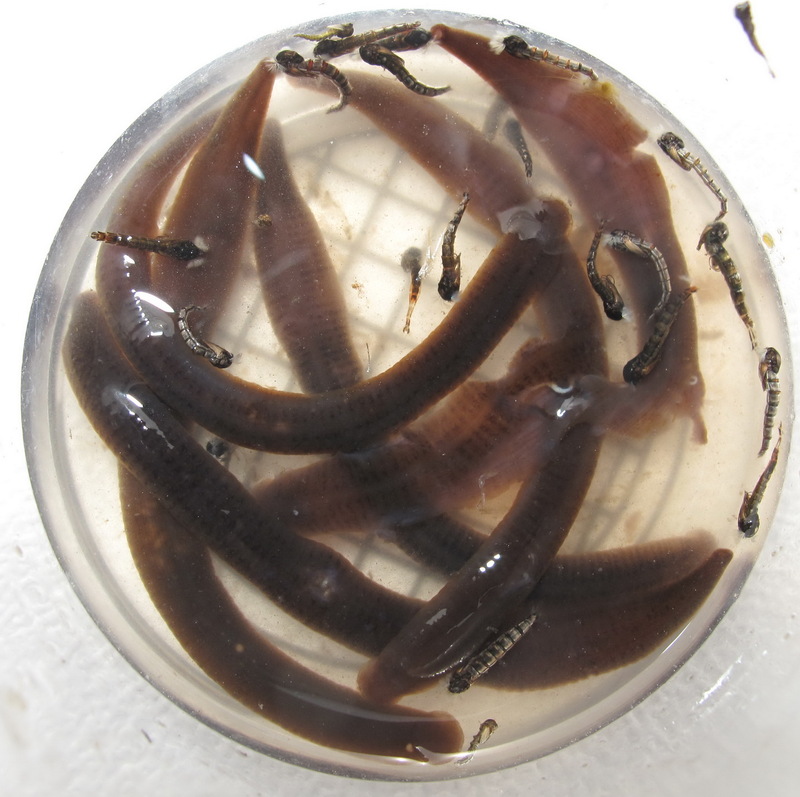 Bead-headed leeches, add more up and down motion to a leech pattern that is stripped thorugh the water column. Tungsten beads, regular metal beads and glass beads used in conjunction with a non-slip loop knot make leeches come alive. Time to start or replenish your leech box!! 4 Responses to "Winter Tying Season upon Us"
Leeches are a great go-to, brookies love em. I had a trip last year to Marmot Lake west of Quesnel last fall and was having a difficult day of fishing. As I was leaving the lake for the day a fellow fisherman was launching his boat and asked, “how was the fishing”? I explain that I was having a tough day and he replied, “Have you tried a balanced leech” ? Embarrassed by the fact I had NO balanced leeches in my box, I replied “no just working and micro leeches”. He replied, A black balanced leech down deep @ 25 feet were just killing them yesterday”. I nodded sheepishly and said “I will have to try that next time”. Needless to say ….I’ve jumped on the balanced leech band wagon and my box is full of them .. :)Come on spring !! Good call! I love tying and fishing leeches. Time to get back on the bench. Brian I am looking for a couple of nets-one for a float tube/river and the other for a boat. I would like the bags fairly deep and to be made of something like the rubber that will not tangle the hooks-suggestions?